"Marcel was the most underrated defenceman ever to play in the league. When he hit you, you were hit. He was a tremendous skater and defensively, he was as good as anyone. He might have been overlooked by the press, but he was never overlooked by his teammates. Years later, I brought him back to Detroit as a coach. He is very knowledgeable and a very astute observer of the game." --Hall of Fame left-winger Ted Lindsay (Pronovost's teammate from 1949-57 and 1964-65) In the spring of 1950, Marcel Pronovost was called up from the minor leagues to play for the Detroit Red Wings during the Stanley Cup playoffs. The 18-year-old defenceman had never seen NHL ice time before, but his performance in the playoffs was so impressive that he took regular turns in the final series against the New York Rangers. That year, Marcel Provonost became the ninth player in history to win a Stanley Cup before playing a single regular-season NHL game. So began Pronovost's 65-year career in pro hockey. As a Red Wing he became a star defenceman in Detroit's golden age, winning three more Stanley Cups between 1952 and 1955, and skating side-by-side with Gordie Howe, Ted Lindsay, and Terry Sawchuk (who became a lifelong friend). He played a pivotal role in the Toronto Maple Leafs' last Stanley Cup win in 1967. He earned recognition on the NHL's First and Second All-Star Teams. And he has continued to serve the game for decades, becoming one of the few NHLers to have success as a player, a coach, and as a scout. 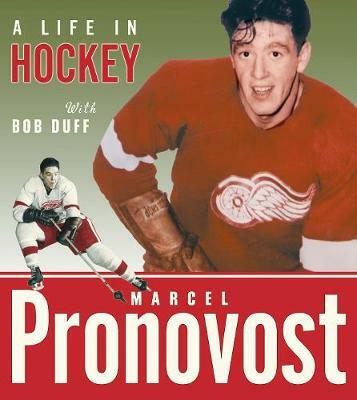 Now, with Marcel Pronovost: A Life in Hockey, this legendary defenceman and Hockey Hall of Famer tells these and other stories for the first time. With over 125 photos and with on-the-ice recollections from the most exciting Original Six Era games ever played, A Life in Hockey is a hard-hitting memoir, and an insider's take on playing, coaching, and scouting that spans seven decades, and surveys one of the longest hockey careers of all time. A must-have autobiography for Red Wings fans, Leafs fans, and hockey buffs everywhere.